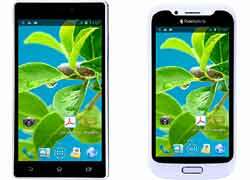 With an aim to double its volumes, low-cost mobile devices maker Datawind on Thursday said it will launch a Rs. 2,000 smartphone before Diwali that will come bundled with free Internet for life. The company said the device will be based on Android operating system and have a 3.5 inch size. Datawind currently has three smartphones and 5 tablets under its portfolio and is selling 40,000-50,000 devices every month. "We are looking forward to launch our Rs. 2,000 smartphone and few other devices before Diwali and intent is to double our sales by the end of this calender year," Datawind Executive Vice President Rupinder Singh said here. He added the company is in talks with three mobile operators for the lifetime free Internet offer but refused to divulge more details as the deal is yet to be finalised. Asked about manufacturing in the country, Singh said the company has aggressive plans but did not mention any timeline for implementation. Datawind had won the contract to supply 1 lakh units of Aakash tablets priced at USD 49.98 apiece in 2011, translated into a price of Rs. 2,276 at that time. The project was then shifted under IIT Bombay and Datawind was asked to supply better version of the product, Aakash 2. Singh said the company had in May last year shipped all the tablets to the government. The Aakash project was former minister Kapil Sibal's brainchild. The idea was to provide low-cost computing device at subsidised rate to students to enable them access Internet for educational purposes. Communications and IT Minister Ravi Shankar Prasad in a recent press conference said Aakash project needs better specifications.